Our progression charts map outcomes for children across a range of strands in English and maths. They have been designed for use as both a planning tool and an assessment tool. Each strand is split into manageable bitesize outcomes to help you identify the key aspects that should be taught in each year group. This will help organise your planning as well as allow you to note where your cohort as well as individuals are in terms of their outcomes and progress. 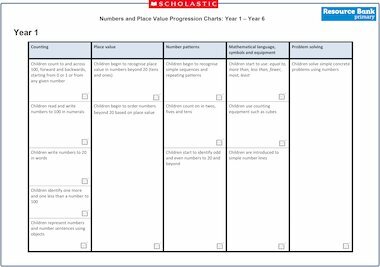 The charts are designed to give you a progression context, so that you can see what children will have covered and learnt in the previous year, and where they are heading to in the year above.